In November 2013 I visited Myanmar (Burma) for 16 days. I had a private tour organized by Myanmar Travel. The organization of the trip was excellent, everything worked like clockwork. I had local guides and drivers at the different locations. To move between locations, I had three internal flights, twice I took public buses, and twice was driven by the guide/driver for the next destination. I had some problems understanding the first couple of guides due to their heavy accent. With the later guides I had less of a problem, this was probably partly due to the fact that I was getting used to their accent. The guides were all knowledgeable. The drivers were good, although a couple of them were driving very slowly, hardly ever over 50 km/h (31 mph), even on good roads outside cities. I arrived in Yangon in the morning after being in airplanes and airports for 36 hours. After cleaning up, we got started with sightseeing in Yangon. This was the first of three stops in that city. The next morning was an early departure on a flight to Heho. All the internal flights were in small twin engine turboprops. In Heho I was greeted by my new guide for the next few days. We drove from Heho to Kalaw. On the way we encountered a procession in support of the local monastery. In the afternoon and the next morning I visited temples in Kalaw. The next day we drove to Nyaungshwe on Inle Lake, where I stayed for two nights. After the first night in Nyaungshwe I went on an full-day excursion on Inle Lake on a small boat. After the second night in Nyaungshwe I drove back to Heho for a flight to Mandalay. After arriving in Mandalay I visited Sagaing Hills with a very nice Buddhist site, Umin Thone Se from 1364. In that area is also the largest nunnery in Myanmar with ~5000 nuns. We continued into Mandalay. One of the highlights there is the palace/fortress. It is a huge square, 2 km (1.2 miles) on a side, with a large moat surrounding the whole palace. There is only one building remaining from the original palace, it survived WWII only because it had been dismantled and stored before WWII. It is a beautifully carved building make of teak wood. Another highlight in Mandalay is the worlds biggest book. The "pages" are stone slabs about 1.5 m (4.9 ft) high, 1 m (3 ft) wide, and 13 cm (5 ") thick, with Buddhist scriptures. There are 730 leaves with 1460 pages of text. The next day we visited the Mahamuni Pagoda, which has a Buddha statues that is thickly covered with gold leaf weighing many tons. We added our share of gold leaf to this Buddha statue. We then visited the Mahagandayone Monastery to watch the midday lunch ritual where 1500 monks receive their lunch meal. Mandalay in total has about 150,000 monks! Across the river outside Mandalay is a 1.2 km (0.7 miles) long bridge made of teak wood. It is about 200 years old. Teak wood, it seems, is not attacked by termites, so many old buildings made of teak survive. We then took a boat to the ancient capital of Mingun on the other side of the main river to visit the Mingun Pagoda, an unfinished huge pagoda, built by King Bodawpaya in 1790, the huge Mingun Bell, made in 1808-1811, and the beautiful Hsinphyumae Pagoda. The Mingun Pagoda would have been the largest pagoda in the world at 150 m (490 ft) had it been finished. Even now it is at 50 m (160 ft) one of the largest pagodas. It was severely damaged by an earthquake in 1839. The Hsinphyumae Pagoda is a beautiful, white pagoda, built in 1816 by King Bodawpaya's grandson and successor King Bagyidaw and dedicated to the memory of his first consort Princess Hsinbyume. After the second night in Mandalay we drove south to Salay. In Salay is the Yoke Sone monastery with a beautifully carved teak wood building, and the Shin Bin Maha Laba Man Temple. From there we drove west to Mt. Popa. Mt. Popa is a spectacular site. The Taung Kalat Monastery sits on top of a volcanic plug that is about 170-180 m (560-590 ft) high and less than 100 m (330 ft) across. I stayed overnight at the Resort Mt. Popa. It was expensive, and the food was mediocre. The next day, my guide and driver from Bagan picked me up and we drove to Bagan, where I stayed for three nights. Bagan was the most interesting site that I visited in Myanmar. There are over 2600 pagodas around Bagan, from very small ones to huge many-storied buildings. On the second day in Bagan I went on a boat tour on the river with a visit to Kyaung-ku Oo Min Temple, built into a cave, with beautiful carved ornaments. After three nights in Bagan I flew back to Yangon for the second stay there. We visited the Royal Lake, and the Chaukhtatkyi Pagoda with a huge reclining Buddha, some 72 m (236 ft) long, from 1907. In the afternoon I took a train ride around Yangon. Early the next morning my guide and I took a public bus (with reserved seats) to Taungoo, where I stayed two nights. After arrival in Taungoo we did a bicycle tour around the city to see some of the Buddhist sites. In the afternoon we discussed how the visit to the elephant camp would work. The next day we drove to the elephant camp, leaving before sunrise at 5:00. The visit to the elephant camp was one of the highlights of my visit to Myanmar. After the second night in Taungoo, my guide and I took the public bus back to Bago, the last town on my visit in Myanmar before the return from Yangon. In Bago I visited one of the largest monasteries in Myanmar. After one night in Bago, my driver from Yangon picked us up and drove us back to Yangon for one more night's stay. On the last day I did some shopping in Yangon. Departure was at 50 minutes after midnight. The name of the country, Myanmar, is actually the original name. When the British colonized the country they named it Burma. It has now reverted back to the original name. After independence from Britain, Myanmar became initially a democracy. After a coup in 1962, it was a military dictatorship. The military relinquished control officially in 2011 and Myanmar became again a democracy. The transition to a democracy however is not entirely smooth. I was told that the crime rate in the larger cities has been increasing dramatically since the end of the military reign. On the other hand, the increase in tourism is helping the economy of Myanmar. There are over 100 different ethnic groups in Myanmar. The largest groups are the Bamar, Shan, Pao, Karen, and Rakhine. The majority of people in Myanmar are Buddhist (80%). About 7% are Christian, 6% follow animist beliefs, 4% are Muslim, and 2% are Hindu. Currently there are significant tensions between Buddhists and Muslims. In general the people in Myanmar are very friendly and helpful. Everybody seems to smile a lot. I didn't encounter many beggars during my visit. There was also not as much pressure from hawkers trying to sell you something as you have in other tourist countries like for instance Egypt. There are a lot of smokers in Myanmar. And most men chew betel nut and spit the red stuff all over the place. Aung San Suu Kyi is held in very high regard by most everybody that I talked to. Many just call her "The Lady". She certainly was instrumental in bringing democracy to Myanmar. As I understand it, she will run for president in the next general election in 2015. If the elections are fair, she will most likely win the election. Myanmar is a very religious country. Every village has Buddhist pagodas and temples, sometimes dozens of them. They are mostly supported by the villagers or local organizations. This includes covering the pagodas with gold leaf every few years. In every temple you can see people praying, this is part of their daily lives. Virtually every village has its own monastery. New monks and nuns go to the monastery when they are 7 years old. Again, the monasteries are supported by their villagers. 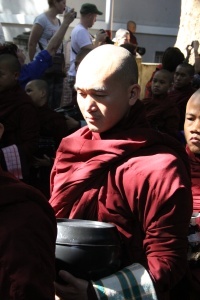 Every morning, the monks walk through the village with their alms bowls to get contributions for their noon meal. They do not eat after the noon meal. Annually, the villages have a festival with a donation drive. I saw one such festival on the way to Kalaw, and back on the next day on the way to Inle Lake. The village people had made floats from their donations (pots and pans, clothes, blankets, detergent, etc), others had built money trees. The procession slowly made its way through the town. Each float had a music band and dancers, and was accompanied by the people who contributed, including women and children. It was quite a spectacle. Up to my visit to Myanmar, I always said that Việt Nam is the country with the best food for my taste of all the countries that I have visited. After this visit I have to say that this distinction now goes to Myanmar. I love the noodle soups with various kinds of noodles, all kinds of fresh vegetables, and a choice of chicken, beef, pork, or fish. The vegetables are always fresh from the market, and the soups are well seasoned with herbs. In some areas, especially in the Shan region, the soups come with hot chilies. That for me gives them the advantage over Việt Nam. In addition to the great taste, the price is great. A large bowl of soup costs only $1.50 - $2.00, only in tourist restaurants was it more expensive. The beer is the ubiquitous German style lager, just what I like. It comes in 0.6 liter (1.3 pints) bottles, which cost only $1.50 - $2.00. The major beer brand had a promotion campaign going. In some of the bottle caps were winning notices. You could win 200, 500 or 1000 kyat ($0.20, $0.50, or $1.00), or a free bottle of beer. I won something from about one in three bottles. Food and Drink was so inexpensive, that I had exchanged too much money ($400), even though I had to pay for lunch and dinner myself. I had to change $100 back at the end of the trip. Traffic outside the large cities was civilized, indeed even somewhat slow. In Mandalay and Yangon, the traffic was very heavy and somewhat without regards for rules. In Mandalay there were not many traffic lights, in the smaller cities there were hardly any. A lot of traffic was on motorcycles and bicycles, in fact, motorcycles seem to be the dominant mode of transportation. There were a lot of ox-drawn carts around. Many streets had paths for these carts on both sides of the road. People in Myanmar seem to love flashing advertising lights. They are everywhere, around stores, around advertising signs, especially in temples. Many Buddha statues have flashing lights around them. Many advertising signs are partially of completely in English. This was a bit surprising, since the target audience are local people, not tourists. People in Myanmar are very religious, this was obvious everywhere. Myanmar is a friendly country, at least in the areas that I visited. People were always smiling. It is certainly worth a visit.